iPad packages have been more or less the same generation after generation, so the iPad 4 retail box should be no surprise to you. All you get inside is a charger and a USB Lightning cable. A manual is also provided but no extra accessories such as a headset or a case. The design of the fourth generation iPad, a.k.a. 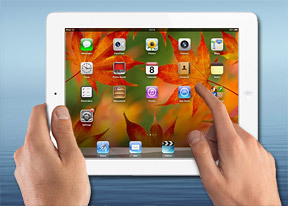 the iPad with Retina display, is, for the most part, a perfect clone of the iPad 3. You've probably guessed that 1% goes to the new Lightning port. The rest is the same, but we're not complaining - there's little that can go wrong with an aluminum unibody and Retina display. And yes - the large bezels prevent the big iPads from look as sharp as the mini, but there are good usability reasons for that. The iPad with Retina is the same size and weight as the iPad 3, standing at 241.2 x 185.7 x 9.4 mm and tipping the scales at 662g. The Wi-Fi only version is some 10g lighter. Compared to the iPad 2, the iPad 4 is just a tad thicker and about 50 grams heavier. But that's a negligible price to pay for much better hardware, camera and almost twice the battery backup. The controls on the fourth generation iPad are completely identical to those on the iPad 2 and 3 - you get a Home key on the front, a power/screen lock key on top, plus a volume rocker and the screen rotation lock on the right. As usual the rotation lock can be configured to act as a mute button instead. Above the Retina display is the FaceTime camera. It got promoted to the HD league and now uses a 1.2MP sensor capable of 720p@30fps video recording. It's not lonely though, the ambient light sensor is around to keep it company, though that one is hard to spot. On top, the iPad 4 has the 3.5mm jack in addition to the Power/Lock key. Thankfully, Apple didn't move the audio connector to the bottom, like they did on the latest iPhone and iPod Touch. Centrally placed at the top is the microphone. The iPad 4's bottom is where the major difference comes in. With the new generation of tablets, Apple retired the old 30-pin connector and placed the new smaller and faster Lightning port in charge. You get a single loudspeaker right next to the connectivity port. Another point for the mini, which has stereo speakers. Around back, the 5 megapixel camera does 1080p@30fps videos but has no flash. 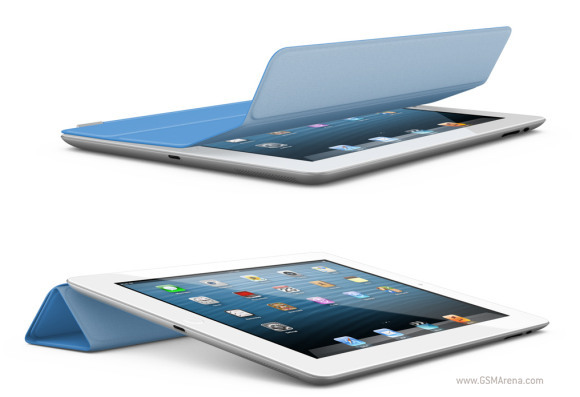 The smart cover for the fourth iPad is completely identical to the ones for the iPad 2 and 3. It magnetically attaches to your iPad to protect its screen and back. It is also easily converted into a stand for extra comfort when typing or watching movies. All Smart Covers currently sold by Apple and third-party manufacturers are fully compatible with the iPad 2, 3 and 4.